Reality TV introduced the topics of people with hoardering disorder and hoarding tendencies to millions of Americans. Many joke about their “hoarding tendencies,” but few grasp the reality of what it’s like to struggle with a hoarding disorder. As a professional organizer, I’ve had the privilege (and sometimes the challenge) of working with clients with hoarding disorder. My hands-on experience has given me a unique understanding of the nature of the disorder and the features of the condition. The effects of hoarding go beyond health and safety risks. There are mental, emotional and physical consequences for individuals with hoarding disorder as well as those around them. My book, From Hoarding to Hope, is an answer to some of the emails and phone calls I’ve received from people all over the globe asking for help — for themselves or for loved ones. Most have never encountered hoarding before and don’t know where to begin or whom to call for help. I began to ask myself if there was a better way to share my knowledge and experience. Through reflection, it became clear that I have a unique vantage point to present a holistic team approach to hoarding disorder and hoarding tendencies. After enjoying a very rewarding career of working with individuals with hoarding disorder (privately and on the A&E television show Hoarders), I realized it was time to pull it all together in a book. This book shares a multidimensional, comprehensive approach to understanding hoarding disorder and hoarding tendencies. From Hoarding to Hope is a guidebook for clinicians, social workers, home health-care workers, public-health officials and related agencies, professional organizers, and animal control personnel. 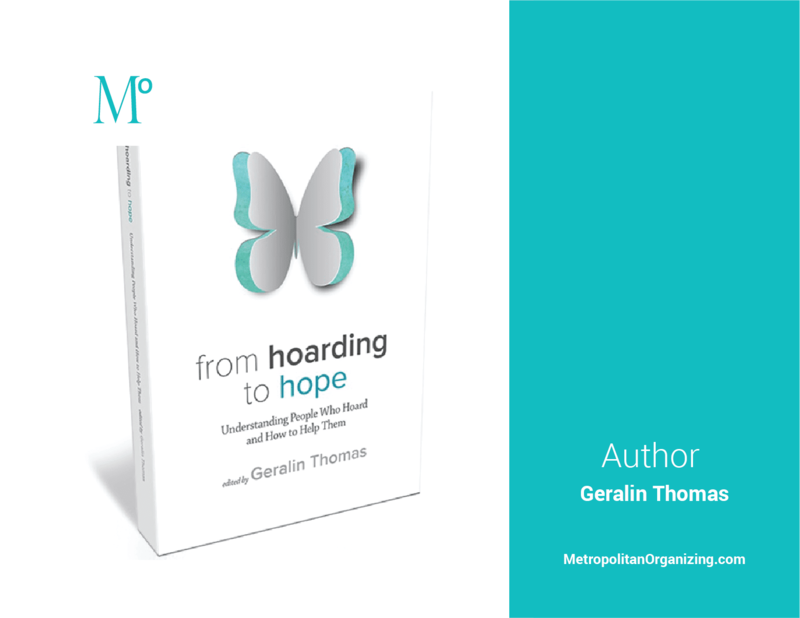 Geralin Thomas, an organizing expert featured on A&E’s TV show Hoarders, and other related professionals offer a compassionate, multidimensional, comprehensive approach to understanding hoarding disorder and hoarding tendencies. Experts address the following questions and more: Does compulsive shopping or OCD lead to hoarding? How and where should contaminated items be disposed of safely? Should a person with a hoarding disorder take part in the decluttering and organizing process? What are the anticipated expenses? When is it time to call in professionals? What should someone reaching out for help expect? The Face of Hoarding Disorder: Real stories from real people—the pain, the conflict, the triumphs big and small. Understanding Hoarding Disorder: Why we save stuff and the difference between clutter, collecting, chronic disorganization and hoarding. Successful Helping: An introduction to the complex world of hoarding and the team approach to working with hoarders. Where Do I Go From Here? Contact information for trusted resources that Thomas recommends with confidence. Nora’s story below captures the essence of why I wrote From Hoarding to Hope: Understanding People Who Hoard and How to Help Them. I lost both my parents in less than a year and I am an only child. When someone dies, there are a great deal of financial and legal matters to deal with and that is after you orchestrate and endure the funerals. My parents lived in Florida and I am in Virginia. They both had Alzheimer’s disease, believe it or not. My mother was my father’s caretaker and her decisions about finances and his care became increasingly questionable. Medical tests revealed that the horror we watched my dad endure was unfolding in her brain as well. She was still living on her own and driving, which she should not have been, but being such a distance away I did not realize how quickly the disease was progressing. After she suffered a major stroke, I was summoned but was not ready for the chaos my tidy, OCD mother’s home had become. There were Post-it® Notes on walls, dressers and the refrigerator — basically wallpapering her duplex with information such as her phone number. All the notes were equally mundane. Mom’s sense of basic priorities had been greatly affected and drawers were full of junk mail and a few precious photos or money, stored in a helter-skelter fashion. After she passed, I spent the next four months sorting and searching for heirlooms and the like, while discarding piles of nonsense after scrutinizing each item carefully. I was horrified that I failed to find any family photo albums, antiques and other heirlooms I’d been promised, and she’d given away nearly half a million dollars to charities. Every charity that contacted her received a check. Since you work with people who hoard, you can well imagine how difficult it was to choose as few possessions as possible to bring back to my overstuffed home in Virginia. I hired professional movers and limited myself to what $1,000 would move. Some of the furniture had been made by my dad who enjoyed woodworking, so those pieces had to be kept. My husband did not grasp how difficult the whole process was. I sobbed as I threw away her curlers, cosmetics and similar items that would not be appropriate for donation. I sold nothing. Instead, I let each of her many friends take an item and I let some really great ($$$$) pieces go. Everything else was donated or given away. Honestly, it took about 15 months before I quit waking up in the morning and remembering my family was gone and feeling the shock anew. When I visited one of those month-to-month storage facilities in order to purchase extra-heavy boxes of the moving company’s desired specifications, the owner told me that business in Florida is booming. When the remaining parent dies, many, many adult children pack it all up and store it instead of making the numerous painful decisions. Grief evidently can make a secret hoarder out of anyone. It is my sincere hope that From Hoarding to Hope becomes a resource for those with hoarding disorder as well as those in a position to help.